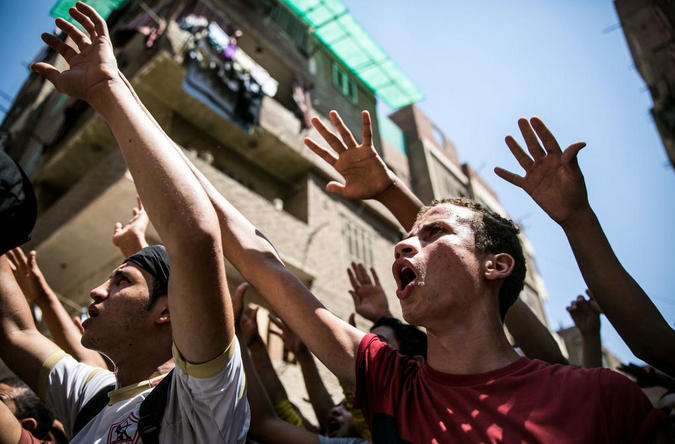 The Alexandria Juvenile Misdemeanor court sentenced Wednesday 78 minors belonging to Egypt’s banned Muslim Brotherhood to prison, with sentences ranging from two to five years. Head of the court, Mosaad al-Refaie charged the minors with “belonging to the banned Muslim Brotherhood”. The children denied participating in protests or belonging to the group. Alexandria security forces had arrested the children while joining a rally in the Moharram Bek area in Alexandria, calling for bringing down the regime and reinstating ousted Islamist President Mohamed Mursi following his ouster in July 2013. Families of the children gathered outside the court, chanting against the military and the police, an eye-witness told Aswat Masriya. The defendants’ lawyer, Ahmed al-Hamrawy, said that legal procedures are being followed to ease the verdict, expecting lighter sentences against many of the defendants. Article 112 of Egypt’s Child Law (Law No. 12 of 1996 Promulgating the Child Law, as amended by Law No. 126 of 2008) states that, “Children may not be detained, placed in custody, or imprisoned with adults in one place,” and that any public official who “detains, places in custody, or imprisons a child with one or more adults in one place” should be sentenced to a minimum of three months in jail and a fine of at least 1000 Egyptian pounds.